In the immediate wake of the Drury Lane shows and the last television series, the Pythons turned their attention to ‘Monty Python and the Holy Grail’, the classic feature film that made ‘Ben Hur’ look like an epic. So, with coconuts in hand, they headed off to darkest, drizzliest Scotland. The assembly of the soundtrack was completed in Andre Jacquemin’s Sunrise studios. Terry Gilliam, co-director of the ‘Holy Grail’ film and co-producer of the album, says: “I have wonderful memories of working in the garden shed. Andre’s 4 track recorder and my 2 track recorder was all we had to work with. Creating atmospheres and sonic worlds was a game of bouncing the sounds back and forth from one recorder to the other". Andre recalls that the ‘Holy Grail’ recording set a precedent: “The Pythons always wanted to give good value for money. Certainly on the ‘Holy Grail’ album they all threw their ideas in to making it quite elaborate. They wanted to make it something funny in its own right". “There was a real sense that we didn’t want to short change the audience,” says Michael Palin. “I felt that if someone had paid to see the film at the cinema, when they bought the album there should be much more on it than just the clips from the film. As Terry G. had directed some of the film it was good to have him at my side while we trawled through the actual soundtrack and all of us were still writing sketches at the time. There were also plenty of leftover sketches from the previous television series. If two or more of us were in the studio, I would pull out some of these unused sketches and record them. A lot of the extra material on the ‘Holy Grail’ record was from this tranche of material but we only used it if it was somehow relevant to the project. The sketch about digging up Marilyn Monroe in order to get her to star in a new film was one of those that seemed to work. They had to be funny too, but Graham played the desperate film director so well we were in safe hands there. Both Terry and I felt we wanted the album to be able to standalone". Terry G. heartily confirms this. “Correct". You see! "Like everything we did, it had to be more than just bog-standard. I was very happy with the album as we did it”. But he also cautions that: “Mike has a diary. I have a fading memory! We produced the album in the same way we did everything: instinct and exquisite taste". The memorable moments from the film were there in huge tracts, of course, but skilfully stitched into the fabric of the new sketches. 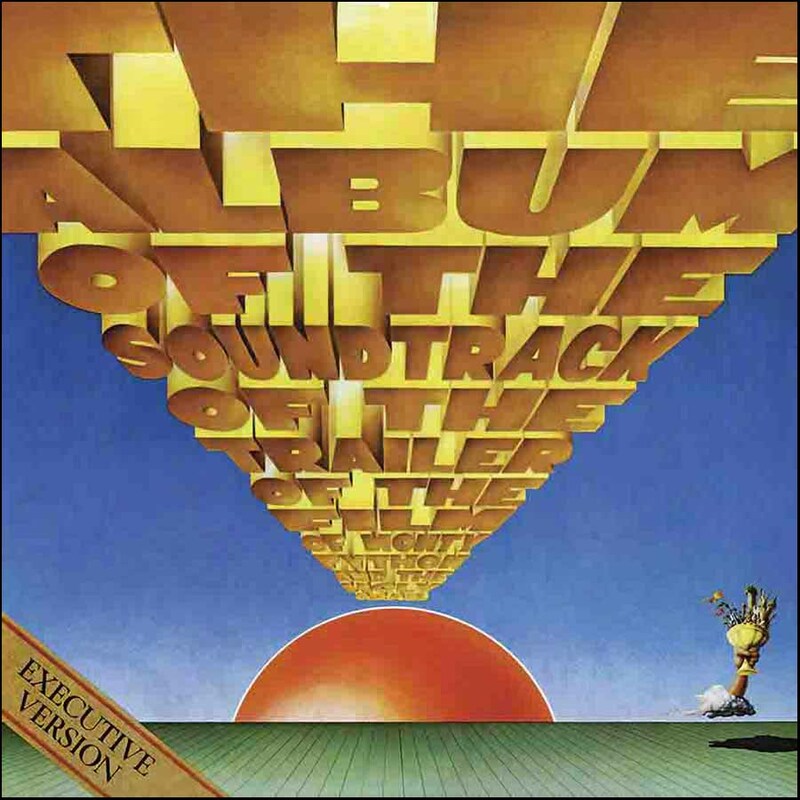 Indeed, ‘The Album of the Soundtrack of the Trailer of the Film of Monty Python and the Holy Grail’ is, in terms of actual content of the film it is soundtracking, probably the most procrastinatious ever released. It’s also one of the funniest. Of course it is. It’s the first Monty Python film soundtrack album! The basic conceit at its heart is that we, the audience, have paid our money and taken our choice of the Executive Version of the film soundtrack. The hilarious drawback of this is that it is selected highlights as seen during a 3.10pm screening of ‘Monty Python and the Holy Grail’ at the Classic cinema, Silbury Hill. As a result, we get the sound of snogging from the stalls, a history of the cinema’s architecture and even a guided tour of the fun palace’s car park. Indeed, the first time we actually hear any material from the film itself is five minutes in and even then it’s simply Graham Chapman as King Arthur with an innocuous cry of “Whoa, there!” The unbridled laughter is explained away as the reaction to a particularly funny bit of visual comedy. Then when the dialogue does fully kick in, it remains practically indistinguishable as a know-all John Cleese drones on and on over the top of it. This commentary is only curtailed by an irritated “Oh, shut up!” from the audience (well, Michael Palin actually). Seven minutes into the album we finally get a proper extract from the film, Bring out your dead, and there are plenty of other classics that are present, correct and clean of Pythonic interruptions. The film's musical highlight, 'Camelot Song' is one of them, included in all its silly glory. Other film scenes lovingly showcased on the album include the Knights That Say ‘Ni’, the Witch-Burning and the Hand Grenade of Antioch but there is certainly a continual sense that anything could happen and it probably will. Even the celebrated French Taunter is rudely interrupted as the film slows down and eventually breaks at what was originally the end of side one. Once again, the original side two didn’t really get back to the plot for ages. Instead there are hilarious ‘The story so far…’ recaps of several completely different films. Laudably, the Pythons couldn’t allow themselves to do anything conventional for too long. 'The Album of the Soundtrack of the Trailer of the Film of Monty Python and the Holy Grail' is a lasting testament to that. Neil Innes wrote a lot of music for ‘Monty Python and the Holy Grail’ and his gleefully gory rendition of ‘Brave Sir Robin’ is included on the album.